An exciting fundraising season that aims to fulfill a promise to the mothers of Kijigari - to bring pure running water to their children this spring - has begun. At least six A Walk for Water events have been planned in cities across the United States! Even if you do not live in one of these cities, you can help Amman Imman finish the construction of the Kijigari borehole. YOU can set up take part in our campaign by setting up an online fundraising page. IT DOESN'T MATTER WHERE YOU LIVE, and it's simple! All you need to do is go to http://www.active.com/donate/awalkforwater, click on "Become a Fundraiser" at the top of the page, select "Fundraise as an individual", and then follow the instructions. You can personalize your page with a message of your own and add a photo. Then you can send the link to friends and family, post it on Facebook, twitter, etc., asking everyone to support your campaign. Every little effort will bring us closer to raising the $50,000 needed to bring water to the people of Kijigari! 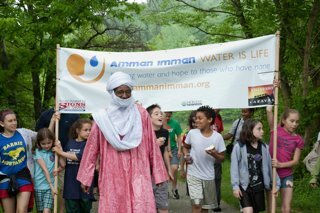 Please consider creating your page and joining our Heroes of Compassion who are hard at work helping Amman Imman: Water is Life finish this Well of Love.